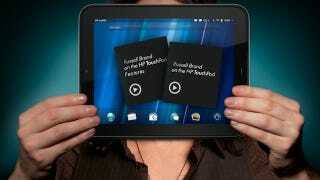 The time's come, cheapasses: HP's $99 TouchPad firesale is about to make its triumphant return. Oh my god I've waited so long for this. At 7:00 PM Eastern on December 11th, HP's eBay store is going to have the next and maybe last cache of cheap TouchPads. $99 16GB models and $150 32GB models will both be up for grabs. That's great! Here's the catch: The units are refurbished, not new—which isn't a bad thing, necessarily!—and all sales are final. But like, who's going to try to return a $99 TouchPad anyway?